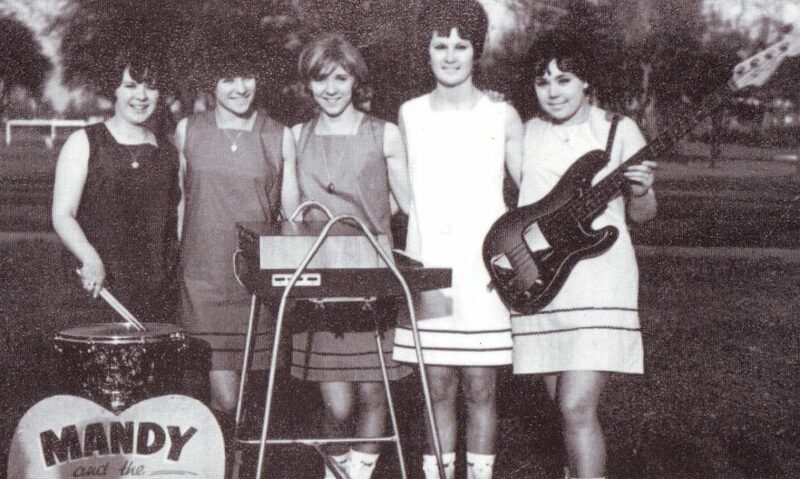 Originated from Hull circa 1965 as Hull's first all-female beat group. They recordeda set of demos at Keith Herd's fairview studios in Hull in 1965 before auditioning for Opportunity Knocks in 1966. 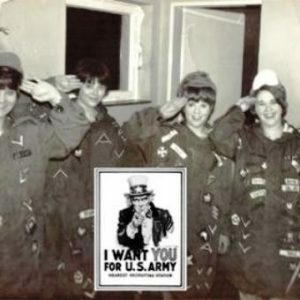 They toured the USA air force bases in Germany and recorded an LP of cover material for US airmen in 1967. The line-up for the LP recording was: Mandy Smith, Merle Pryor, Margaret Wedgner, Betty Beaumont, Hilary Morgan. 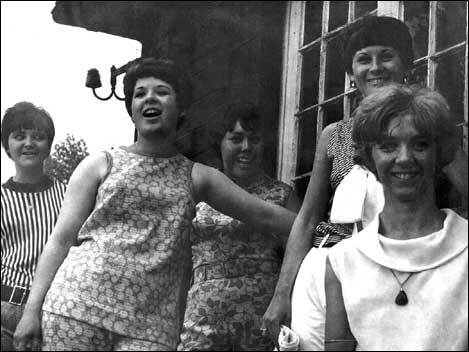 After the group disbanded in 1967, Margaret Wedgner, Betty Beaumont and Merle Pryor joined Linda Thompson to form The Honeys. After The Honeys, Wedgner moved to join Sugar and Spice after their EMI recording contract to play the cabaret circuit. 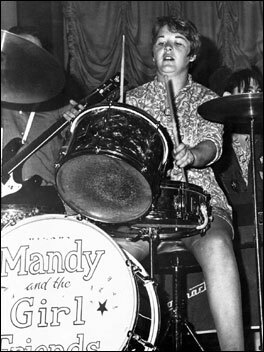 "Mandy and the Girlfriends were one of Britain’s ‘garage’ groups of the 1960s. Their all-girl line-up gave them a novelty value that attracted the crowds both in their home town of Hull and at gigs in London. 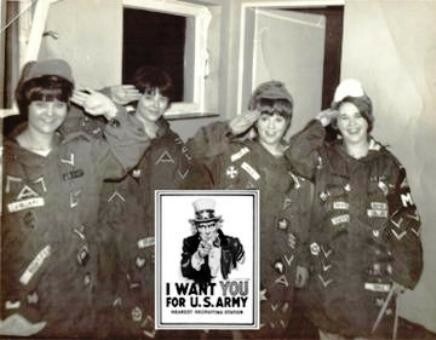 In 1967, they left for Germany, where they toured US air bases and recorded an LP before splitting a year later. 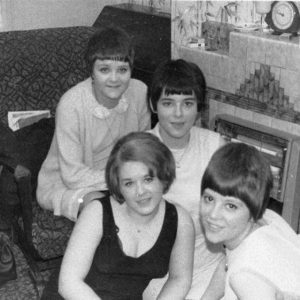 The group was formed in Hull in 1965. Lead singer Mandy Smith had been singing in a band called Mandy and the Moonrakers with her brother, Dennis. However, one evening she met drummer Hilary Morgan and bass guitarist Lesley Saxil-Neilson in local club, Sombreros, and they decided to form an all-girl group. Further members Karen Baker (guitar), Lynda Harrison (vocals) and Margaret Wedgner (guitar) were recruited over the following months. 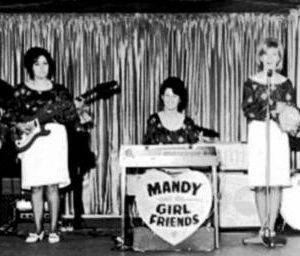 All the members of Mandy and the Girlfriends, as they became, were aged 16 or 17. Each had quit school at 15 and most had ended up in jobs where their passion for music remained unfulfilled. The girls began spending as much of their free time together as possible, practising in the shed in Mandy’s back garden. News of the band spread around Hull and a combination of talent and novelty value soon brought bookings. 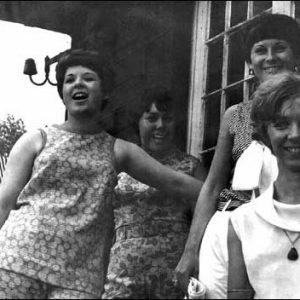 Within a year, the group was performing at local clubs, clad in dresses that had been run up by Karen’s mother. Dennis was roped in as their driver and would also take on managing their business affairs, and, because of their age, Mandy’s mother would act as their chaperone. Disaster struck when Karen quit the group to get married, but Londoner Merle Prior was quickly brought in as her replacement. The band was then invited to record some tracks at the Fairview studios in Hull, though the results remain unreleased (featured here). By this time, the girls had become known further afield, including in London, where they appeared in a club on the same bill as The Animals. The gig proved to be a highlight of their career. In 1967, they were invited to perform a tour of US air bases in Germany. They accepted the offer and would spend three months in Germany and a month then back at home at a time. They were put in a dilemma while in Germany, however, when they received a letter from the producers of TV’s Opportunity Knocks. They had auditioned for the talent show before leaving Hull and TV bosses now wanted them to appear on the programme. Collectively, however, the girls opted to remain in Germany – for them, the thrill was in performing live, they decided. The group attracted a lot of attention in Germany. So much so, that they were invited to cut an LP. Recorded in a front room lined with egg boxes to create the right acoustics, the girls spent four hours recording twelve songs for the album. Like their live set, the LP was a collection of cover versions, including their takes on Motown (Barrett Strong’s Money and Martha and the Vandellas’ Dancing in the Street), The Drifters’ Under the Boardwalk, The Animals’ House of the Rising Sun and the wartime classic White cliffs of Dover. Hilary also attracted another kind of attention in Germany – from a GI. 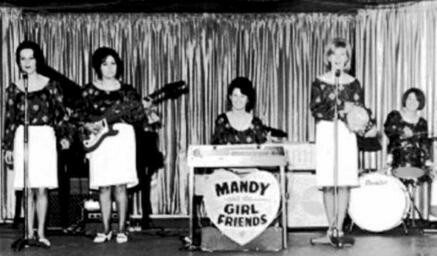 And when she quit the group in 1968 to marry him, it proved the end of Mandy and the Girlfriends. She remained out of the business until 1974. The rest of the group went their different ways. Lynda became a singer with the resident band at Hull’s Skyline ballroom and Lesley joined a succession of bands. Margaret and Merle became a duo, the Honeys, before joining forces with a band called The Fabians to become comedy show group Sugar and Spice (see entry). In this incarnation they played at gigs where The Who and, later, The Bee Gees were the headline acts. The group remain in touch and occasionally get together for reunions. Hilary and Margaret were interviewed by BBC Radio Humberside in 2010. 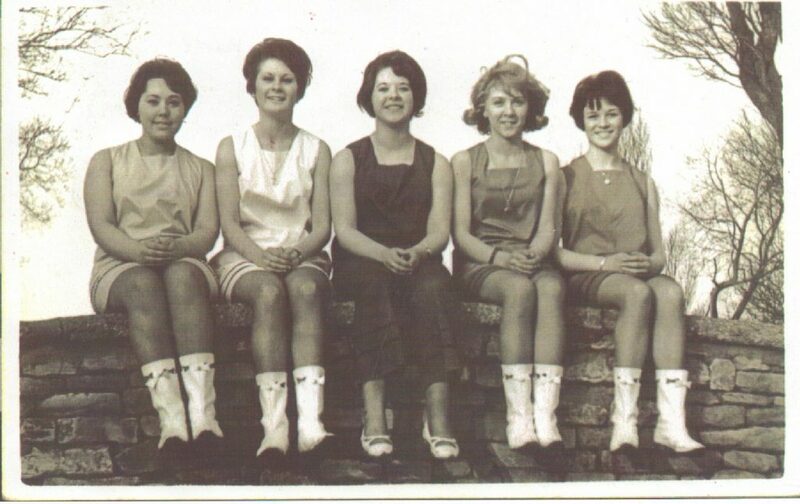 Firstly, I must mention that Hilary and Lesley had the original idea to form a five piece group first, and it would be named, "The Queen Bees," as a tribute to their local idols and all male counterparts called "The King bees." They approached Mandy during a Maybury pub gig, who loved the idea. It was agreed that Hilary, a shop assistant would take drum lessons, and Lesley, also a shop assistant at the time would end up learning bass. Then after reaching an acceptable standard, they'd begin rehearsing with the other three girls. Hilary received some basic drumming help from various group drummers, including the drum guru; "Dave Harvey (Dave Harvey Set aka The Pavement – see entry) and Lesley, who knows everybody did likewise for bass lessons. However, by the time they were ready, they discovered the name Queen bees had been dropped in favour of Mandy and the Girlfriends. Unfortunately, there wasn't a thing they could do about it as it had already been duly registered. 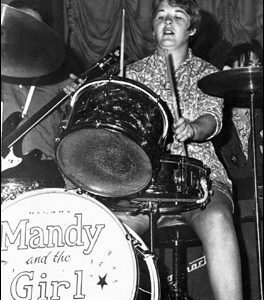 1965: Mandy currently playing regular gigs at Maybury pub as lead vocalist with "Mandy and the Moonrakers. Her brother, Denis Smith was their bass player at this time. Next: Karen Baker joined Mandy as her accompanying pianist/vocal harmonies, on Mandy’s first solo gigs. Karen was a trainee dental nurse and member of the well- established Marie Garth Singers at the time, who basically taught herself to play at home. They rehearsed a club routine at Karen’s house. Next: Lynda Harrison asked Karen if she could come to one of their rehearsals. 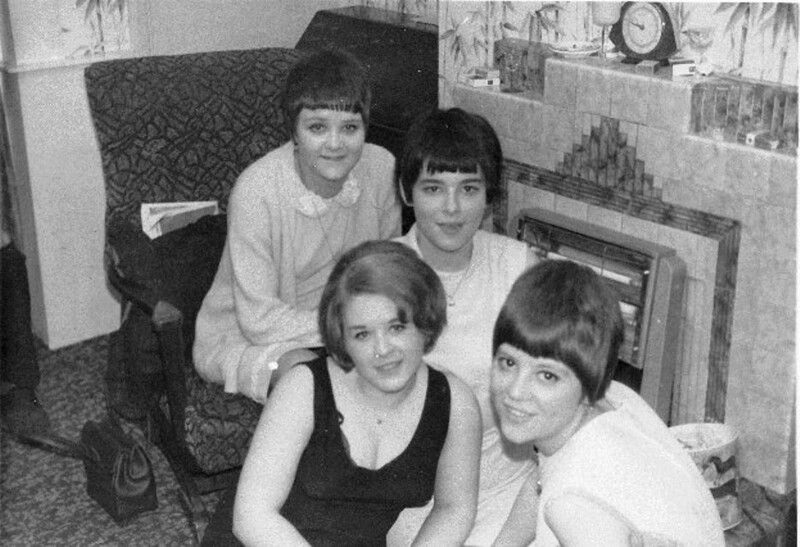 Lynda, an apprentice hairdresser lived opposite Karen’s house at the time. 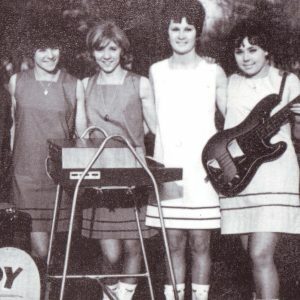 It was agreed and after dropping a third harmony in one of their songs, Lynda was asked to join them both as second vocalist and thus was born Mandy and The Girlfriends Harmony Trio. Then there were five: The new group proved to be a great idea and the gigs began rolling in. They were also among the first local groups to record demo tracks at Hull’s Fairview studio. This was when Keith Herd, through lack of dosh, had to convert his front room into a studio and forced to render it soundproof using hundreds of empty egg boxes which he scrounged from various sources. He built his own 4 track recording desk and engineered the whole process himself, from recording to mixing and onto magnetic master tapes which he'd keep. The tracks would finally go on reel to reel tapes when required. Such was the technology of the time. Through hard graft, begging for scraps and his natural gift as recording engineer, Keith’s front room studio quickly became the top place for local bands to record their material. Keith's dream was also coming to fruition. 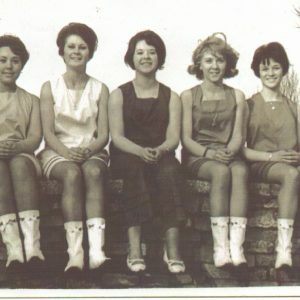 Sugar and Spice was officially formed on Jan 1st 1968 through the joint efforts of Merle, Maggy (now on bass guitar) and Honey's drummer Glen Petty, Linda Thompsons replacement, along with Tony Aulde (hilarious front man) and guitarist, Barry Donald, both members of Beverley-based group The Fabians." Mandy Smith (vocals), Karen Baker (keyboard, vocals), Merle Pryor (keyboards, vocals), Marion Hill (keyboards, vocals), Linda Harrision (guitar, vocals), Margaret Wedgner (guitar, vocals), Lesley Nielson (bass guitar, vocals), Betty Beaumont (bass guitar, vocals), Hilary Morgan (drums), Maureen Scholes (drums). All recorded and photographic material copyright Beaumont, Morgan, Scholes, Harrison, Brown, Wedgner, Pryor, Smith, Baker, Hill. 2012. Very special thanks to: Margaret Brown, Leslie Skillings, Merle Pryor, Allee Willis, Keith Herd.